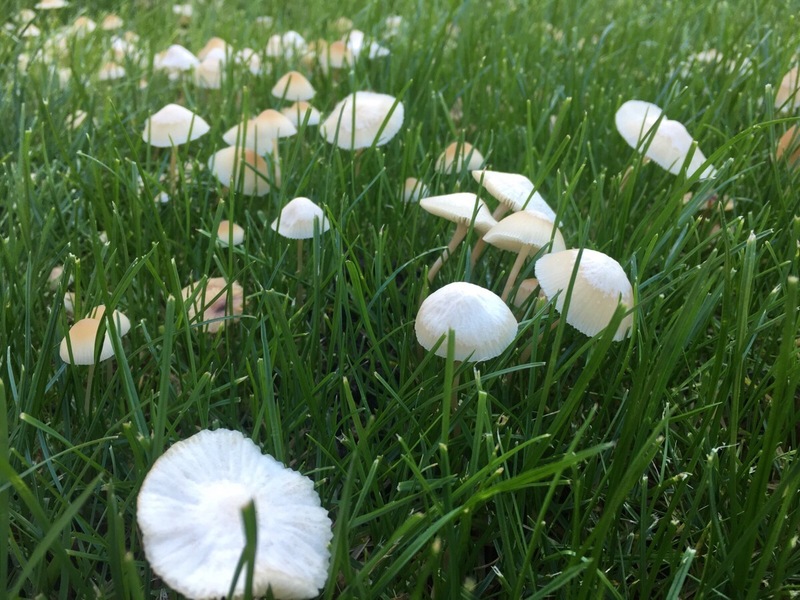 Green Man Lawn Care > News > Lawn Problems > Mushrooms in my lawn! Mushrooms are the fruiting body (reproductive system) of fungus. Fungus is everywhere. Without it, we wouldn’t be able to survive. Amongst other things, fungus helps to break down old living materials and tissues, turning them into nutrients. In your lawn, the soil is alive with living organisms ranging from microscopic grubs to earth worms. Other living materials such as tree roots, grass clippings, leaves and grass roots also reside in your soil. When these living organisms die, fungus helps to break them down (decompose), turning them into vital soil nutrients. Just like all other living organisms, fungus also need to reproduce. Plants create seeds that are commonly sealed in to the flowers or the fruit of the plant. Rather than seeds, fungus creates spores that are carried through the air or by animals to new areas. These spores are formed and stored in the gills of the mushrooms. In order to reproduce, fungus needs a damp environment. For mushrooms to grow, the ground and air temperatures must be above freezing. During the autumn, conditions are often perfect for mushrooms to grow as the soil is saturated. When we experience warm days, it is common to find mushrooms flourishing. Will they affect my lawn? 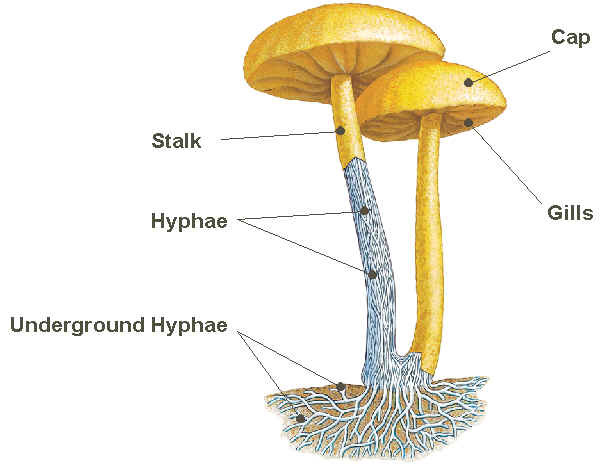 Although the fungus itself is made up of tiny fibrous threads that resemble roots (known as Hyphae), the mushrooms themselves don’t have a root network, and therefore don’t directly compete for nutrients They take up very little space, and their lifespan is also very short, so there will be minimal to almost no negative affects to your lawn. Of course, they can be fairly unsightly if there are hundreds of them! 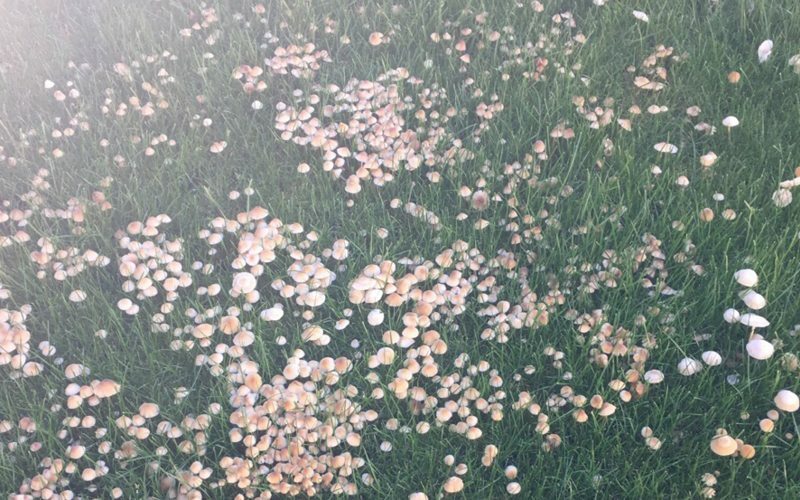 In some cases, mushrooms can be a sign of a lawn problem known as Fairy Ring. If the mushrooms are growing in a circle or ring, or even a part circle, it is advised to get it properly diagnosed to avoid further damage. The best method is to simply remove the mushrooms from the ground by picking them out from the base without digging in to the soil. They are delicate and will break away from the base quite easily. They can be disposed of in to a compost heap or green recycling bin. If you lawn is covered, you can always use your lawn mower on a high cut setting to remove the heads of the mushrooms. Does my lawn require a fungicide treatment? As we mentioned earlier, fungus helps the soil remain nutritious by decomposing old living material. And, as the actual mushrooms have very little negative impact (and in most cases, no negative impact) on the overall health of your lawn, we don’t normally recommend applying a fungicide treatment. Fungicide treatments are designed for managing fungal related diseases such as Red Thread and Fusarium, both of which have a negative impact on lawns.